Home Blog New Keto Weight Loss™ Formula! New Keto Weight Loss™ Formula! If you’re following a ketogenic diet, your goal is likely centered around weight loss. This low-carb diet is notorious for its fast results due the extreme macro restrictions. Your daily calories come from 75% fats, 20% protein and 5% carbs – a far departure from most people’s everyday diet. If you’re just getting started, you know this diet can be difficult to stick to. That’s where Keto Weight Loss™ comes in. This fat burner formula combines caffeine, beta-hydroxybutyrate (BHB) salts, medium-chain triglycerides (MCTs) and raspberry ketones to support those on a ketogenic diet. How? 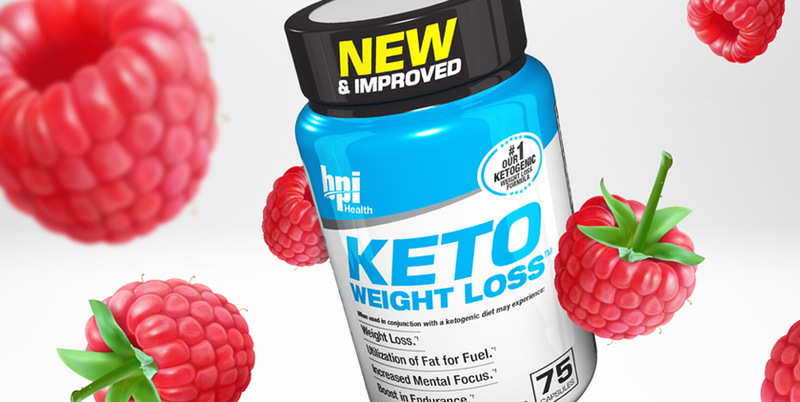 The latest addition to our Keto Weight Loss™ formula, raspberry ketones are chemicals found in red raspberries. Scientific evidence suggests that raspberry ketones may increase metabolism and help the fat within cells to break down more effectively, which helps the body burn fat faster. Caffeine is a stimulant shown to improve brain function, boost mood and increase vigilance, reaction time and memory. It is a common ingredient in fat burners since it helps burn excess body fat through thermogenesis. In turn, your body temperature increases and so does your metabolism. BHB salts consist of sodium, potassium and beta-hydroxybutyrate. They are considered exogenous ketones, or a source of ketones outside of your body. This means that even if you aren’t in ketosis, you can still reap the benefits of the mental and physical energy provided by ketones. They are also crucial to helping you save hard-earned muscle. By helping to maintain your blood sugar levels, BHB salts encourage your body to turn to ketones for energy rather than the protein in muscle. MCTs are a form of saturated fatty acid that the body absorbs and metabolizes faster than the long-chain triglycerides found in vegetable oils and animal fats. They are sent directly to the liver, where they have a thermogenic effect that may result in an increase in energy and a boost in metabolism. These “healthy” fats can also help support heart health and cognitive function.